This is a 7" HDMI display with capacitive touchscreen. It comes with a 7" LCD screen with capacitive touch panel overlay on it. The touch panel supports up to 5 touch points. And it adopts DFRobot USB free-driver technology, no special requirement of drivers. You can use it as easy as keyboard or mouse. It can be directly plugged to PC for touching control. In combination with HDMI HD screen, it can turn a large PC to a tablet immediately. The screen supports Windows, Linux and MAC OS. It can be used on Lattepanda, Raspberry Pi and other HDMI device. We also make some special hole to make it compatible with Arduino screw hole. You can mount them on the back of the display directly. There is no need for external power supply for the screen, it can be powered by USB port and HDMI port. The display also supports back light adjustment. It is very convenient to adjust backlight by potentiometer on the back of the display. Note: Please guarantee the external power supply current is above 1.5A@5V when it is driven by raspberry Pi. The lower current will reduce the touching sensitivity. Outline Dimensions: 165mm x 100mm/6.50" x 3.94"
Outside Mounting Size: 155mm x 90mm/6.10" x 3.54"
Inside Mounting Size: 58mm x 49mm/2.83" x 1.93"
You need to reset resolution to avoid touch differentiation caused by resolution difference between Raspberry Pi and the Touchscreen. NOTE: Windows and MAC operating system can capture resolution automatically, so you don't need to modify any parameter. If there is a dialog box, click Continue to install. Win 7 (32-bit/64-bit) Download msvcr100d.dll, place it in the C:\Windows\System32 directory, and then re-install the driver. There will be no mistakes. 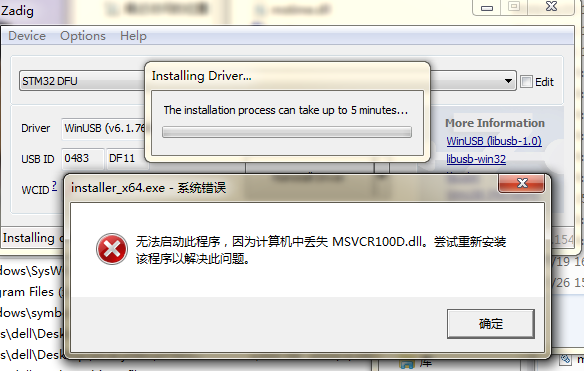 Win 8 32-bit Download msvcr100d.dll, place it in the C:\Windows\System32 directory, and then re-install the driver. 6. Firmware update, Click to download, unzip and copy the xxxx.dfu, erase.bin, and upload.py from the windows directory to the "desktop > dfu-util-0.9-win64". 7. 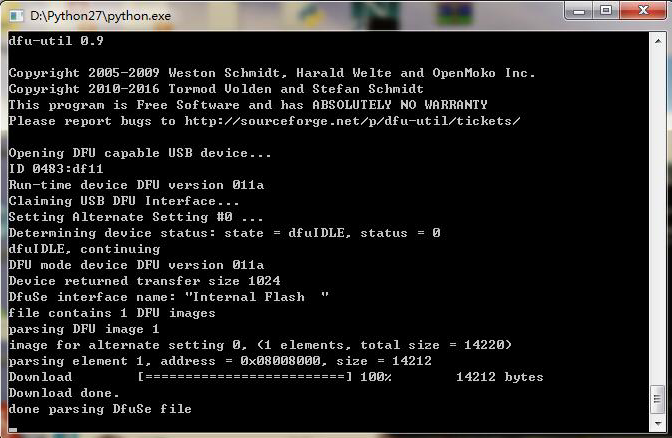 Run upload.py (Windows need to install python firstly. Click to download. 8. The following interface appears, indicating that the program is being burned. 9. After the burning is completed, replug the USB device. 4. Firmware update. Click to download. Use sudo python upload.py to run the program. 5. Replug the USB device. Search for "terminal" on the top of the screen. Q After connected Raspberry Pi, the sensitivity of the touchscreen became very poor and the response became lower. How to solve it? A 1. Please check the power of Raspberry Pi. When using the touchscreen, the minimum power supply is 1.5V. 2. Check the resolution configuration, we wrote the Raspberry Pi tutorial for your reference. Get 7" HDMI Display with Capacitive Touchscreen from DFRobot Store or DFRobot Distributor.